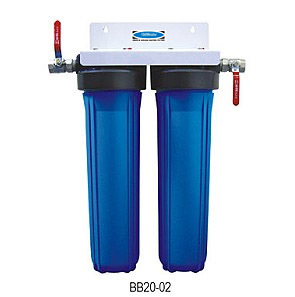 PurePro Aqua-Star (BB20-02) Whole House Water Filter Systems are modular systems that allow you to custom order a water filter system for your water treatment requirements. This ensures removal of all contaminants pollutants and turbidity found in your water so you have the best combination of water pressure and water quality. Natural well water does not undergo preliminary testing or treatment. The source of your well water can be changed at any time from contaminants entering the aquifer or water source. PurePro Big-Blue filter systems allow you to build a customized system made just for you and you family. Jumbo Filter Systems deliver pure, fresh, clean tasting water to assure your family's health and peace of mind. The first stage is 5 microns pre-filter designed to remove sediment as well as other biological contaminants. It comes in two options with varying proportions of flow rate and sediment removal. PurePro uses a very special blend of catalyst combined to reduce contaminants by 99.99% or more, including Volatile Organic Compounds (VOC's), lead and other heavy metals, cysts, E Coli, Guardia, Cryptosporidium, taste and odors.